The year was 1964. America was faced with passing a piece of legislation that would fundamentally change our country forever as we knew it - the Civil Rights Act of 1964. This single piece of legislation changed America from a country where segregated lunch counters were commonplace into a country where, today, the only segregated lunch counters we've ever heard of are the ones we read about in history books. A crucial vote came to the floor of the United States House of Representatives to pass this law and make desegregation a reality in America. The Democratic party, at that time, was the Majority party in the House, outnumbering the Republicans 248 to 172. However, there was a very determined faction of renegade Democrats within the Democratic party known as the "Dixiecrats" (the word "Dixie" being a reference to the South where most of the members were from), and the Dixiecrats had successfully defeated Civil Rights legislation in the House since the 1950's. The national sentiment at the time was one that embraced the change of racial harmony. The American people wanted change, but the recalcitrant Dixiecrats didn't care. They held the country hostage to their own desires, even though they were an extreme minority of approximately 90 members of the 248 Democrats in the House. The entire democratic concept of "Majority Rule", or the will of the American people for that matter, was lost on these people. Does any of this sound familiar to anyone? Fast forward a few decades to 2011. Here we are, in the 11th hour, facing a decision that has the potential to fundamentally destroy our country as we know it. But within the House of Representatives, where the Republicans constitute the Majority party, there is a small renegade faction of about 60 Republicans (most of them Freshmen) who call themselves the "Tea Party." Much like their Dixiecrat predecessors, they do not care about Majority Rule. They do not care about the will of the American People. They do not even care about their own House Republican leader, John Boehner. In fact, if the present case is any indicator, we can safely draw the conclusion that they do not even care about America itself. They only care about one thing - their own interests. Unfortunately for the rest of us, their interests have been informed by misinformation about the real problems that face America right now during this down recession. They have convinced themselves, and the media who follows them to no end, that the #1 problem facing America right here and now is the budget of the United States Government. Not the millions of Americans who are unemployed. Not the millions of Americans who have lost their homes. No. The #1 problem is that we must stop the Federal Government from spending because, all of a sudden, ever since the Black guy took over, it has become a priority. When Bush outspent Obama during his 8 years by nearly 4 trillion dollars (see chart at left) none of these so-called fiscally conservative Tea Party voices were anywhere to be found. Now, after the inauguration of the first Black president, you can't stop their voices from permeating the 6 o'clock news with their misinformed talking points and their political posturing. And what's worse is that now their misunderstanding of government may threaten the very existence of this government, should the United States of America be forced into a default on its Full Faith and Credit for the first time in world history. Fortunately for us, a silver lining can be divined from history here. 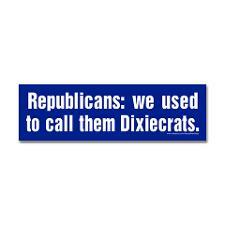 The Dixiecrats, try as they did, were ultimately unable to prevent the will of the American people from changing this country for the better. The Civil Rights Act of 1964 was passed - without their votes - and America turned the page on state-sanctioned racism. Here, the will of the American people could not be any clearer: our country should NOT go into default. To the extent that the Tea Party positions itself against this message, come next year's election they will likely find themselves in the exact same place as the Dixiecrats: in a history book. What are your thoughts on the Tea Party's position on the Debt Ceiling? On the Tea Party in general? Are they similar to the Dixiecrats of the 1960's? Can they stand in the way of the American people? Have the American people finally learned their lesson about the Tea Party? A Product of Our Environment?